The prince of weirdness edits his gargantuan soundtrack to a German silent film to be simply monstrous. However, this monster inspires more of a shrug than a scream. If The Golem Rock Album is your first post-Pixies experience with Charles K. Thompson -- the only consistent name throughout his musical career as Black Francis, Frank Black and, lurking on Internet fan forums, frankusblackus -- a couple things will be apparent immediately that are worth mentioning. First, his voice has changed. There's more grit in his growl, and that’s to be expected considering the Pixies last fooled the world with an album 19 years ago (let's hear your pipes now compared to those of 1991). Second, if he wants to sing out, he'll sing out. He didn't completely sidestep melody when he was firmly etching 4AD on the map, but there are more than barks and moans here, a vestige of the more straightforward Frank Black that came out in Nashville holidays in the sun like 2005's Honeycomb. Listeners reacquainting themselves with Black Francis may be reminiscing about the ghosts of Pixies past, but this album wouldn't exist if it weren't for looking back in wonder. 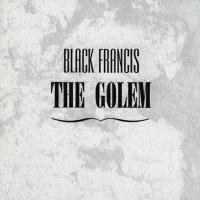 The recording reviewed here is a compressed revision of Francis's original soundtrack for The Golem: How He Came Into the World, a black and white slice of silent German Expressionism that passed for a horror flick in 1920. You don’t need to know or even give a flying caribou about the film's existence to appreciate this version, and knowing the lowdown actually spoils the cryptic quality of Francis's writing -- you may have had no idea what sci-fi brain batter like "slicing up eyeballs" referred to on Doolittle, but damn it if you didn't love it that much more because. Initially released as a five-disc box set on his web site, aimed at the same fans who compulsively shelled out for Minotaur, the specifically-titled The Golem Rock Album shaves most of the reprises and extras from the more elaborate soundtrack. There are intentional exceptions: the slow surf guitar in "Miriam and Florian Theme (Version 2)" has a pretty old patent number, as does the decidedly Francis irony in putting a second version first (remember the release of "Velvety" in instrumental form years before the Catholics revealed the full thing?). Still, at 18 songs in one hour, The Golem Rock Album is monstrous enough to be classified as a deuce. This emphasizes the ominous, imposing tone to the collection (although "Astaroth" is a deft, Jagger-fied cut of head-ripping piano-boogie), and that means there's repetition. Some selections tip toe the same detached chord progression ("(Oh I Wish I Could) Stay" and "The Maharal"), but sound barely awake enough to finish. Even as a soundtrack it falters, as it infrequently jives with the visuals of the movie up on Black's web site. The context isn't the only thing that looks back. There's been some talk about The Golem being the continuation of a return to roots that began with 2007's return-to-name Bluefinger -- a new phase Black Francis album, if you will. Yes, those stray high notes we know all too well still haven't left ground control, and I hope they never do, no matter who Francis has backing him. There are signifiers galore -- those guitar notes, different singing styles in the course of one song, graphic lyrics -- but a rehash it isn't. "Meet Me at the Ghetto Gates" is a New Orleans funeral march peeling with rusty saxophone (sadly the most overused instrument on the album, but necessary here). "The Flower Song" is a beautifully subdued waltz through a dead garden, but here Francis just sounds like he needs some water, just as on the falsetto-laden "Custom All the Way", a likeable enough song you can imagine driving to but never having an impulse to play. "The Obedient Servent" is a true prize in spite of its placement, with Mr. Thompson declaring he'll "hurt he who hurts you / I will be fervent". The chorus snaps it together after some low noise meandering, proving no matter where Francis looks for inspiration, that keen sense of melody will still be his North Star. This sounds unfair, but The Golem's main flaw is that it isn't galactic-meatballs fantastic. He assures someone he'll be fervent in his role as protector, but that urgency doesn't reach all the way to track 18. "The Word" and "Makanujo" are wonderfully jerky -- and after all, that 6 down there ain't a "D" -- but too many of the songs reach out and touch without really grabbing. Franco Blanco, Black Frank, or whatever he wants to call himself doesn't make bad albums, whether with the Pixies, solo, or semi-solo, but the fact that The Golem Rock Album is merely decent is a letdown on its own.